The National Bureau of Economic Research (NBER) released a report this week that quantified U.S. economic activity from 2012 to 2014 and found that $3.5 trillion of the increased equity of the U.S. stock market has been the result of shale oil development. EID has noted before that ancillary industries — or those that make up the supply chain — have experienced major growth as a result of shale development. Take a moment to watch the following EID video to learn more about the impacts on the supply chain. In addition to allowing people stimulate their local economics by spending higher levels of disposable income at local businesses, the “income effect” can lead to even bigger things, such as the opening of new businesses or what recently occurred in Susquehanna County, Pa., where residents were able to raise money to assist the donations of Cabot Oil and Gas and build a new, much-needed hospital for the county. Nowhere is this “price effect” more visible than in the manufacturing industry. That said, it is important to understand the NBER report only looks at shale oil development and does not include shale gas in its estimates. Shale gas has a great story to tell as well. 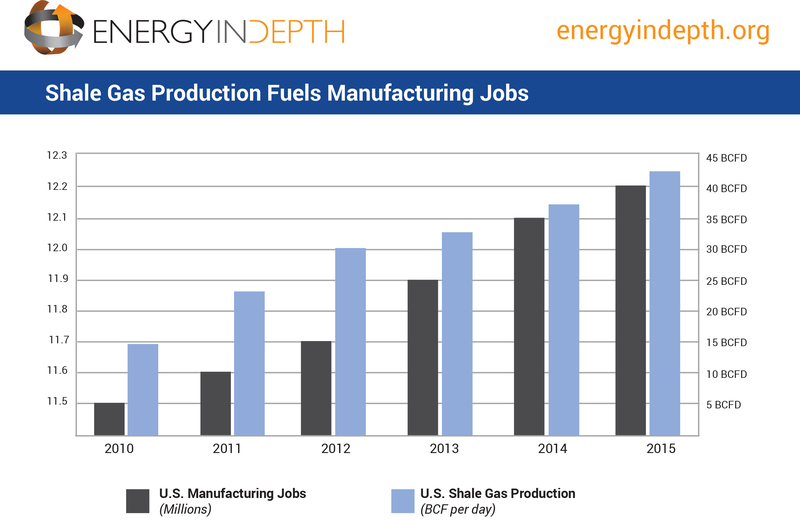 As the following EID chart shows, U.S. manufacturing has been revitalized at the same time shale gas production skyrocketed. There are numerous examples throughout the country of shale gas and oil development’s stimulation of jobs growth. As of 2014, the Marcellus Shale alone created more than 15,000 direct jobs in Pennsylvania, representing nearly a 260 percent increase in employment since 2007. The Leeds School of Business in Colorado reported that the industry supported 94,000 jobs in the state in 2014. In Texas, that number was 444,000, and oil extraction supported more than 24,000 jobs in North Dakota, where the state touted a minuscule 2.8 percent unemployment rate.